The Olympic silver medalist will be running as the party’s candidate in the Clondalkin area. 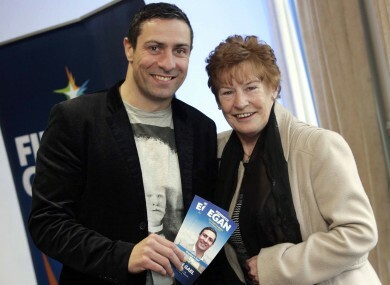 Kenny Egan with his mother Maura at his campaign launch today. OLYMPIC SILVER MEDIALIST Kenny Egan will be running on the Fine Gael ticket in local elections in this year. Confirmed this morning after much speculation in the past week, the light-heavyweight boxer will be the party’s candidate in the Clondalkin area. “My motto is and always has been to ‘Keep it Real’ and I intend to follow this on my political journey,” he said in a statement today, a slogan also carried on his already-printed canvas cards. Egan, who now wishes to be referred to as “Kenneth” rather than Kenny, is looking to base his campaign on youth affairs. “We need to start educating them about alcohol [and other dangers they face],” he said, aiming to share his own experiences alcohol abuse. He was tight-lipped as to whether he hopes to use this as a stepping stone to Leinster House, noting that it was his “first day here”. Kenny said he was prompted to take run in the local elections after an approach by Minister for Children Frances Fitzgerald, TD for Dublin Mid West, who said he will be a “fantastic addition” to Fine Gael. She noted his work in “helping young people in the Clondalkin to achieve the very best they can”. However, he said that “it didn’t really matter what party” he was involved in, instead saying it was the work of Minister Fitzgerald and current Clondalkin councillor Tony Delaney that prompted him to run for Fine Gael. He dismissed previous reports that he was approached by other parties. I am delighted to be joining Fine Gael’s team for the upcoming local elections. I am running because I want to make a difference in my local community. I was born and bred in Clondalkin, and I am very committed to the area. I want to do the very best for Clondalkin, and I believe I can achieve that with Fine Gael’. I am looking forward to meeting as many local people as possible on the campaign trail in the coming weeks and months and hearing about the issues that matter to them most. I am also really pleased to be working alongside my running mate, Cllr. Emer Higgins, who already has a very strong reputation for delivering for the area. My motto is and always has been to ‘Keep it Real’ and I intend to follow this on my political journey. As with my sporting career, I have always aimed for success and, if elected, I will bring the same energy to working for my community. Email “Kenny Egan steps into the ring for Fine Gael, would like to be known as 'Kenneth'”. Feedback on “Kenny Egan steps into the ring for Fine Gael, would like to be known as 'Kenneth'”.